The irony of having an electronic leash attached to the one piece of freedom hasn’t escaped me but, still, reality is that every single one of us has a phone nowadays. I’ll just stick to the idea that it’s for location services, only, and move right along. 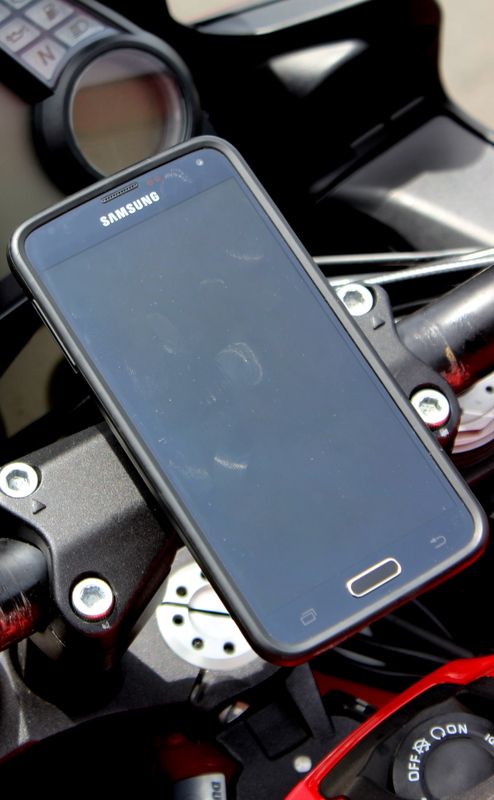 There are a myriad of options on how to mount your favorite phone to your favorite steed and they range from articulated arms to flimsy nylon and plastic pieces. While browsing through the Interwebz I came across a once little company by the name of Quad Lock Mounting Systems (www.quadlockcase.com). They specialize in the active lifestyles, which might need use of their modern phones. What drew my attention was the sheer simplicity of the Quad Lock design. It’s a four-sided slide-mount with a spring lock, which allows for quick on/off mounting operation. Simplicity may mean a lack of tendency for failure. I didn’t find anything specific to motorcycling – are you reading, QD? – but, they do have an adhesive option, which would allow you to post their nifty mount to just about any surface. If your motorcycle’s handlebar is the round one-piece type, then the bicycle option would easily work for you, as it has for us. The phone attaches to the locking system via a hard and protective case which the phone sits in, with an optional waterproof top cover just in case your phone isn’t already a waterproof unit. 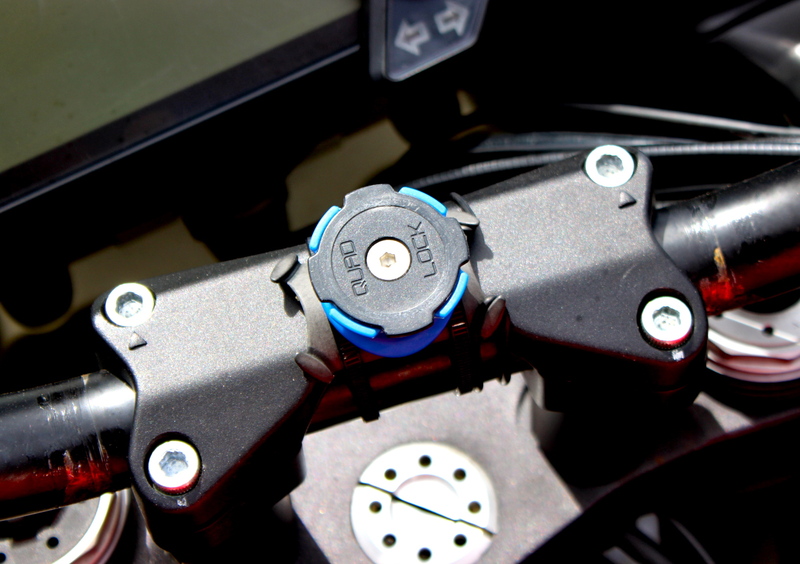 The mount is small with a simple design, for bicycles, but applicable for those of us with handlebars. The phone will sit either horizontally or vertically, depending on your preference. Convenience in a small and useable package. 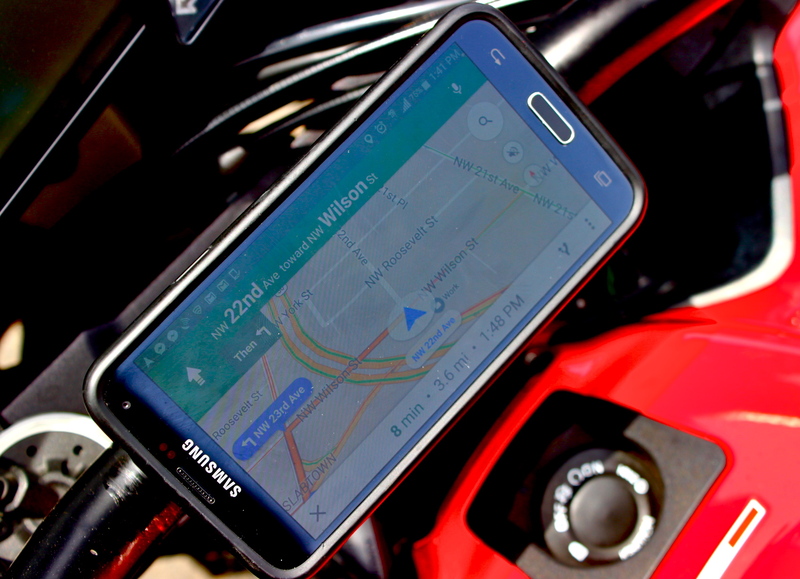 Although made for bicycle applications, once properly mounted on your motorcycle, the design is pretty fantastic for GPS application usage of your smartphone device. There is even a car mount, which uses a large lever type suction cup to mount the device to the windshield of your car, so it’s pretty easy to transition from motorcycle to car to belt buckle, as their options list is pretty great. Overall, it’s a nifty device for a very reasonable price and it works, well.